Namco Bandai is looking for your input on a Pac-Man redesign. While the classic Pac-Man and ghost sprites are iconic in their own right, the franchise's artwork hasn't enjoyed the same acclaim. Perhaps because the Pac-Man sprit is so abstract - he's basically a genderless, ravenous pie chart come to think of it - seeing him with legs, boots, eyebrows and, if you ever watched the cartoon series, a fedora, always seemed kind of weird. 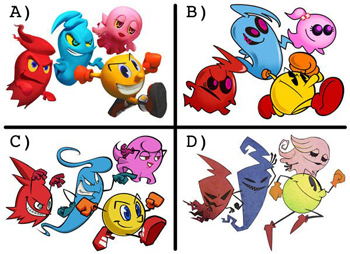 Some iterations were more popular than others, and these new designs featured in a survey on the franchise's official Facebook page all draw from different periods in the character's history. The survey asks users to pick out designs for an as-of-yet unannounced Pac-Man title. A looks very similar to the 3D renders of Pac-Man used during the PlayStation era. B's thickened limbs and solid black eyes hark back to the designs that adorned the original arcade cabinets. C seems to pull from the 3D-animated TV series set to air in 2013. Personally, I'm partial to D, with its sharp lines and faded "retro" color work. The survey then goes on to ask what platform you like to play casual games on, as well as the usual questions about age and gender. Did you vote? If so, which did you pick? It's an opinion poll, so there are no right answers, but I would like to add that every answer that isn't D is wrong.